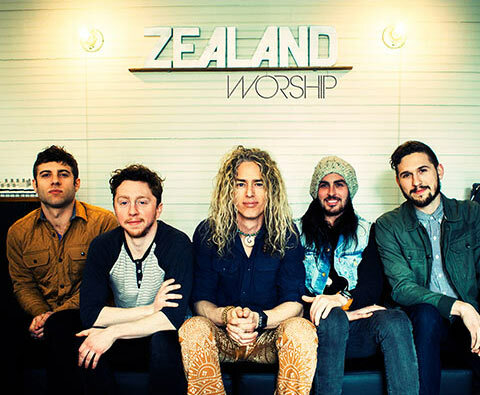 For the past few years, former Newsboys bassist/vocalist Phil Joel has been developing a new worship band named Zealand, and now the band is readying their debut release with Word Records. If you know me then you'll know that I'm basically a communication hippie, or as some might say, a member of the "Urban Amish". Haha! And, just like my food, I enjoy my communication to be as organic and real as possible. I say this to apologize to those 'movers and shakers' who have already deleted this email because it contains more than a single paragraph. Since leaving Newsboys, I've had a blast being independent and operating off the grid and outside the channels of the regular Christian music world. It's always been about relationships and partnering with like-minded people to do music and ministry as effectively as possible…and I love it! For the past few years, Zealand has been operating "off the grid", writing songs and going where we have felt led, ministering where we have been invited, under the radar. To be honest with you, I never saw myself entering back into the record company world of Christian music again until I met the Word Records people. These guys really understand the heart of what I'm about and share my passion to see people enter into worship and get excited about life in the Lord. It's evident by noting the bands that Word have on their roster 'For King and Country', 'Need To Breathe', 'Sidewalk Prophets', 'Switchfoot' and Skillet' just to name drop a few. Forgive me if this is sounding like an infomercial…it's not meant to, it's just that I've never been more invigorated and excited to see the lights come on for people - Zealand Worship has become the vehicle to do just that. Anyway, today is a big day for the Zealand guys and I, and we'd like to welcome you to our adventure. If you have a minute, visit zealandworship.com to see what we've been up to and hear some of our new songs! Bless you and we'll see you out on the road soon. For more info on Zealand visit the JFH Artists Database. For more info on Phil Joel visit the JFH Artists Database.